More than two years later, they’re still riding the KC Streetcar and in mass quantities. 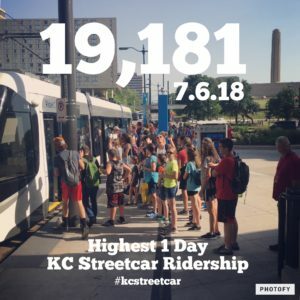 For the week of July 2 – 8, 2018, the KC Streetcar recorded its highest weekly ridership to date with 78,998 rides. 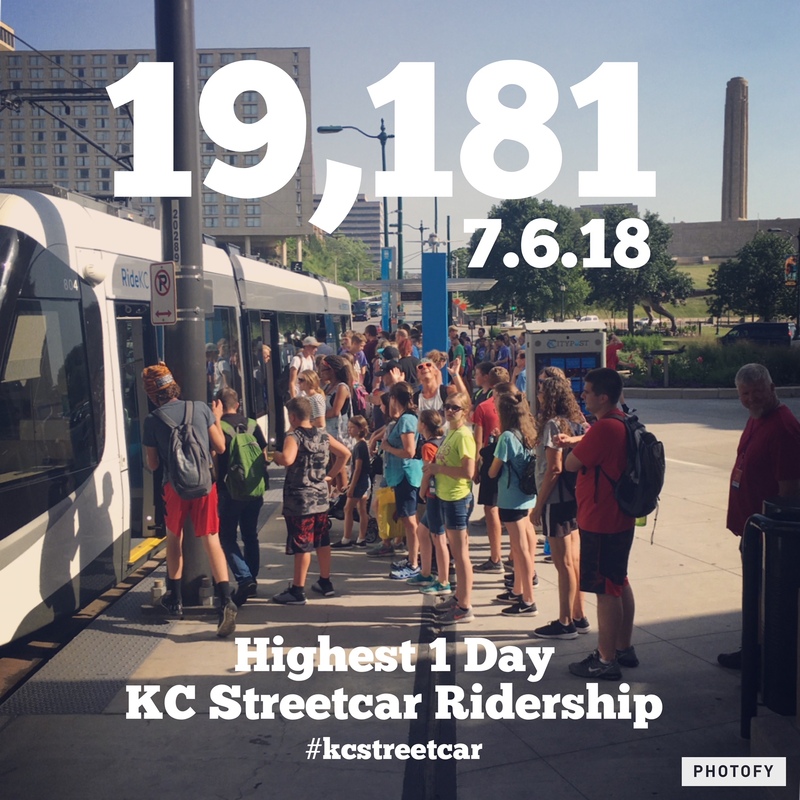 On Friday, July 6, 2018, which also happened to be a First Friday in downtown Kansas City from the Crossroads District to the City Market, the KC Streetcar recorded its highest daily ridership to date with a total of 19,181 rides. That is nearly 2,000 more rides than the previous day of May 6, 2017, which had a daily ridership total of 17,267. “The public response has been amazing. Our service is consistently carrying thousands of passengers a day and has helped redefine the downtown Kansas City experience for residents, employees and visitors,” said Tom Gerend, executive director, KC Streetcar Authority. The summer months tend to be the busiest for streetcar ridership, with the previous months of July being the highest months for ridership. July 2016 was the highest monthly ridership to date with 233,683 rides, followed by July 2017 with 230,925 rides for the month. “There seems to be an uptick in downtown activity this summer between the events, conventions, and new restaurant, hotel and business openings. 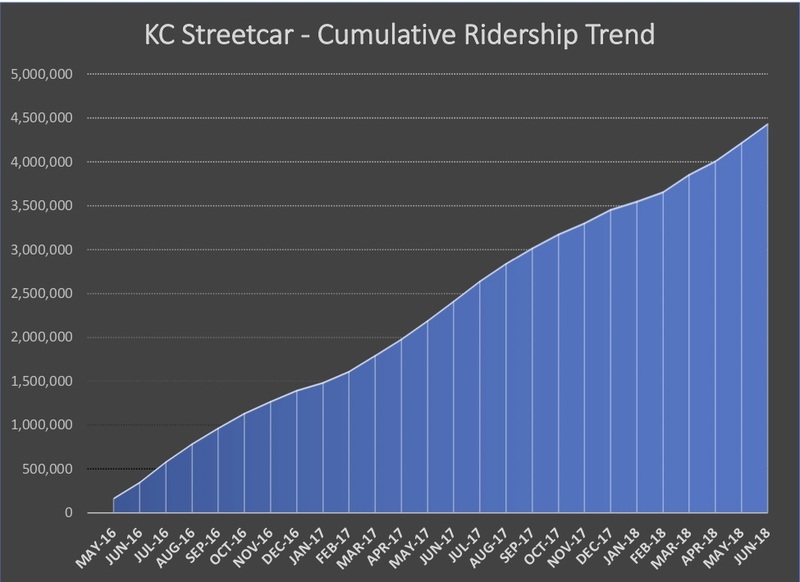 All of that, plus the 25,000 residents that now call downtown home, leads to higher ridership on the KC Streetcar,” said Donna Mandelbaum, communications director with the KC Streetcar Authority. Ridership is important but so is safety and reliability. 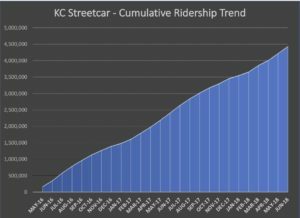 The KC Streetcar has an average on-time performance of nearly 95 percent. This means that the streetcar arrives when expected and delivers passengers safely to their destination. The KC Streetcar Authority (KCSA) is also committed to partnering with organizations and groups that can use the streetcar to explore downtown. KCSA is currently partnered with the Art in the Loop Foundation to bring art to public spaces, which includes nine art installations/performances and eight live music performances on board the streetcars and at streetcar stops. The KCSA is also partnered with the Eric Berry Foundation, SoFar Sounds KC, the KCP&L District, First Fridays in the Crossroads, the KC Library, the Downtown Council, Union Station, 816 Day/Downtown Neighborhood Association, the City Market, VisitKC, as well as local businesses and groups to promote their events as well as promote the streetcar as a safe and reliable form of transit to and from those events.